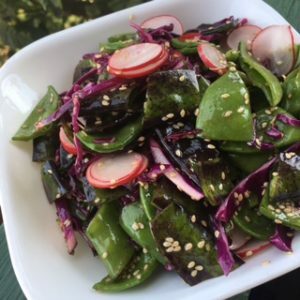 Chef Chelsea’s spring salad of snow peas and radishes is like a spring tonic, full of fresh, local goodness. Prepare the peas by cutting off the ends and slicing them on a 1 inch diagonal. Add the sliced radishes, cabbage, and sesame seeds. In a small bowl whisk the dressing ingredients. Combine everything and season with salt and pepper.